Why Gaz? Why why why???? I'm up to my eyeballs in my own campaign and you go and do this to me! Ohhhhhhhh hell count me in! Now I'll have to see what fits into the time period. 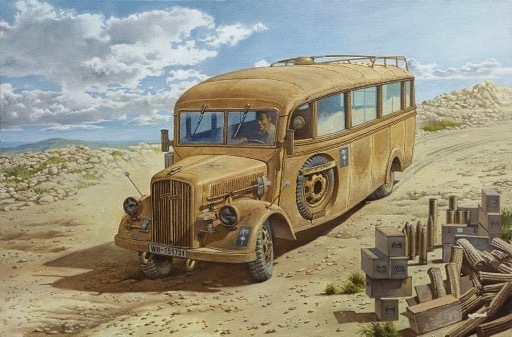 Count me in too, I love desert stuff and have a number of 1/35th kits I could do. Excellent! Glad to see more guys interested. Chris, With more than six months until the campaign begins, you should have heaps of time to clear a couple campaigns. And this proposed campaign is a bit longer than six months. So, more time, yet. I'm in with the Tamiya Tillie. Proper British colours, none of this captured stuff. I'll also see if I can dig out a completed Airfix Matilda in 1:76 I built about 30 years ago. My eyes were rather better then. Great to see you again. Looking forward to seeing a lot of British armor in this campaign. Hoopefully somebody has some of the older Cruiser tanks to build. Sadly so much British armor is unknown to me. Before recent reading, I didn't even know about any cruiser tanks prior to the Crusader. Part of the "Campaign" experience for me is research and learning from the other entries- and this campaign really fits the bill! Thank you for the quick approval! So--looking at my stash, about half of my kits fall into this one. I'll do some research and figure out what to build. There are a lot of rarities I think fit in like the PzJag I and that handful of desert Stug's. Brit-wise, I have to acknowledge that I don't know enough. I'm gonna try to do two for this campaign. I have a friend willing to sell me Miniart Valentine, and I have a Dragon Orange Box PZIIIg in my stash screaming to be built. OK, I'm going to roll with my MiniArt Valentine Mk VI. I'll fit it out to a regiment in service at the time (TBD). It has some AM workable tracks from Bronco with it, and an RB barrel (I think it's the 2lber?). Anyways, should be a kick in the pants, and I'm looking forward to the sandy, sandy goodness. I'm gonna try to do two for this campaign. That's a good idea Gaz. Given the long of campaign period I may try that as well. We've already seen some great ideas for the campaign. A bus! I never would have imagined! I'm keen to get started, too. Thankfully I have enough idle styrene in my stash to keep me busy for a couple years at least. I have Tentative idea for a ribbon. If anyone has an idea, please feel free to post it.